I don't know about you, but I've been feeling the stress slowly creeping up on me. I don't know what happened, but it feels like my calendar has gone from absolutely empty, to completely filled with things to do and places to be. And although I always try to stay calm and not panic, sometimes it's just plain hard to battle stress. Luckily, I feel like I'm pretty decent at handling stress. I manage to stay calm during a crisis and to not let all the things that I have to do drive me crazy. So how do I do it? Maybe a part of it is due to my personality, but I also feel like it comes down to just how you deal with stress. 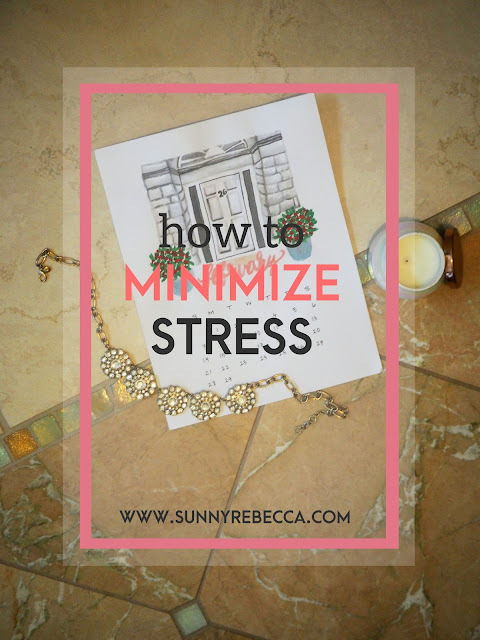 How you cope with stress can minimize the degree of stress that you feel, so here are my tips for doing so based on my personal experiences. This is probably the most helpful tip to avoiding stress, but also the hardest one to put into use. It's easier said than done. I see you out there, reading this post and procrastinating on your responsibilities. However, I always try to avoid procrastinating so that after I finish everything that I need to get done, I have time to relax and not stress out, since everything is already finished. Try to stay one step ahead of schedule, so that if you do end up having an off-day where you procrastinate just a little bit too much, you're still on schedule with everything that you need to get done. Allocate a certain amount of time each day to "Me-time". I. Love. Me-Time. Every day, I try to give myself at least half an hour where I don't do any work, but rather do something relaxing or work on a passion project. I always have a little me-time in the time between when I finish all my work and when I go to sleep. Sometimes I'll watch something on Netflix or just hang out on my phone doing absolutely nothing productive. Having a little time every day where I don't need to focus on anything, just do whatever I want, is so therapeutic, it keeps me sane. After all, Marthe Troly-Curtin once said, "Time you enjoy wasting is not wasted time". And it's true. Although some people feel guilty about having me-time while there's a mountain of work to do, sometimes you just need to put some time aside to just waste time, get all of that stress out. The thing about me-time is that it's different from procrastination. Me-time is about de-stressing. However, I do understand that it's a slippery slope from me-time to procrastination, so I suggest that you limit the amount of time for me-time (actually adhere to these time limits) and try and only have this time after you've finished your work. It's so much more satisfying to have me-time when you have nothing to worry about doing. I know that it seems counterproductive, but just a little more time sleeping and a little less time working can transform your stress levels. When you have a lot to do, the instinct is usually to stay up late and finish it, but when you do that, you end up ruining your productivity for the next day and increasing your stress as a result. Getting a little more sleep, one hour can be life-changing, and you'll be so much more alert and ready to tackle everything that you have to do. For me, it's always easier to stay calm when I'm well rested and on my feet. It's hard to think when you're tired, so you might as well maximize your time by getting a bit more sleep and getting through a power-hour (or more) of quality work done. I cannot function without 8 hours of sleep, since my sleep schedule is so regular, but I can still get everything that I need to get done. Despite the fact that a lot of my friends taking the same courses find the need to stay up late working on their assignments, by getting enough sleep, it makes me more alert and more sane to get everything done more productively, efficiently, and stress-free than if I had been tired and worn-out. As an extension to the "get more sleep" tip, setting a bedtime not only ensures that you get enough sleep, but it also encourages you to get your work done by a certain time. Just because you're not a kid anymore doesn't mean that bedtimes still aren't a thing. Give yourself a designated time that you plan to go to sleep at, mine is 10pm. so that you will be striving to get everything done by the designated time. Having a bedtime is kind of like having a due date, something that will motivate you to get everything done by that certain time. Since I know that I want to be in bed by 10pm, it motivates me to get all my things done by 10pm, so as I'm watching the clock I can figure out how much time I have allotted to get everything done and think of a game plan for how I can most efficiently finish it all before the time. Sometimes I don't finish everything by 10pm, but in that case I'll spend a little extra time working, but I always feel guilty when I go over my self-prescribed bedtime, so even when I need a little more time to get everything done, I still get in bed by 11pm. Sometimes for me, all it takes is a little self-motivation. Tell yourself all kinds of positive affirmations as you handle difficult tasks. It sounds a little silly, but honestly, it works somehow. As you're tackling something rough, say to yourself, "I can do this." I think that saying affirmations, even though they're to yourself, puts you in a positive growth mindset. Instead of being stuck in your "I can't do this" thinking, you open up your mind to some positivity. I need to try your tips.